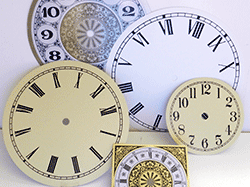 Shop in Canada for Quality Clock Parts at the Best Canadian Prices. 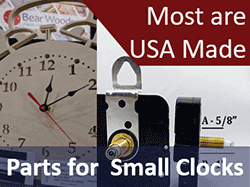 Shop now for clock motors, clock inserts, clock hands and clock dials - great selection and value. 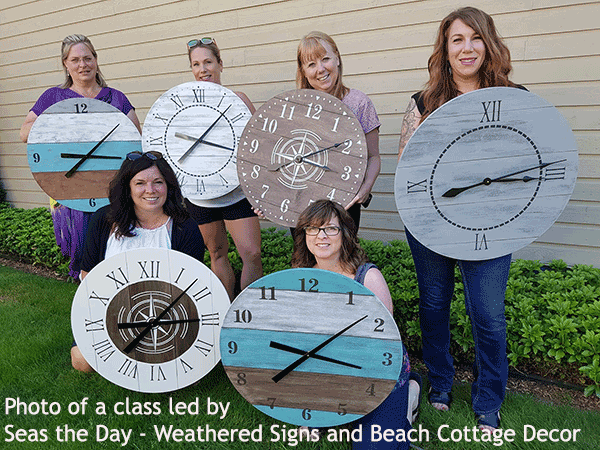 Our thanks for the photo goes to Seas the Day, a fantastic business in Comox, BC where they run frequent classes that teach painting & clock-making. How did they do it? Check out our blog post! 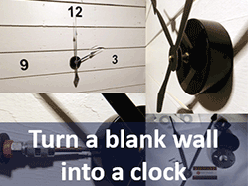 Here is a DIY Large Wall Clock Summary: The 24" clocks shown use High Torque (Higher Power) Clock Movements. The clock hands are 10" and numbers painted on. 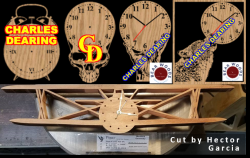 »» We also have a couple clocks made with the scroll saw by Wesley Balko of Scroll Saw Cafe - one features 4" clock hands and our Q-14 motor, and the other shows a 3.5" clock insert. 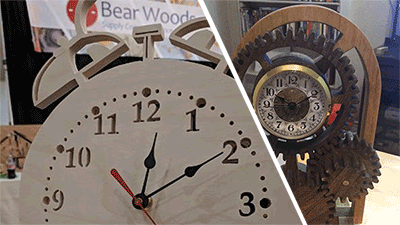 Trust Bear Woods for high quality quartz clock movements to make or repair your clocks. 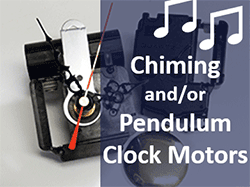 Choose from pendulum clock mechanisms, Westminster chime clockworks, clock inserts and weather instruments. We also have a wide selection of clock dials and clock hands. 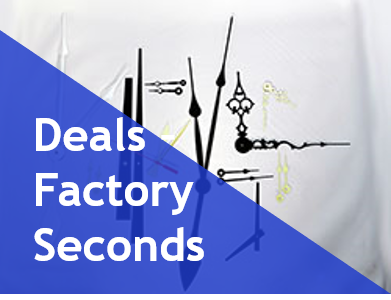 Guaranteed low prices - whether you need 1 replacement clock motor or 100 sets of clock movements and hands, you can join thousands who trust us for quality clock parts each month. See reviews product by product as you shop. We love serving schools, small and medium-sized businesses - all customers are welcome! Want to set-up an account? Contact us and we'll do our best. 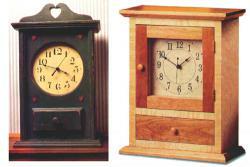 Tips: When repairing a clock we always recommend new hands as your old ones may not fit. 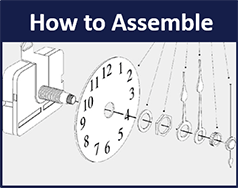 Know your Dimensions »Click Here for Step by Step instructions, diagrams and videos to help you choose the perfect parts to make a new clock or repair an old one. How long does the clock shaft need to be? How long of hands do you want? 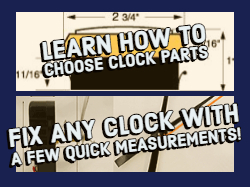 What is the mounting hole diameter for your clock insert? 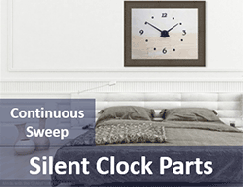 1) Shop by Category Below - you can see the range of popular movements and inserts - within each category you will find the different sizes of clock inserts and clock repair parts. 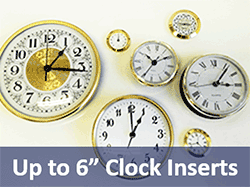 2) Buy more, save more - volume discount prices on most clock inserts and replacement clock motors. 3) Clock hanging and picture hanging hardware also available at fantastic prices. 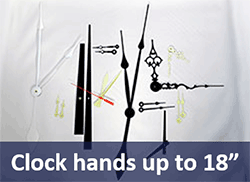 Purchase Clock Hands up to 18"
» Replacement Clock Hands From 1-5/16" up to 18"